Galaxy 2000 replacement alternating air mattress is designed for the rough and tumble of nursing home and hospital usage. With reliability as of absolute paramount importance, Galaxy 2000 system have no elaborate or unnecessary electronics, that can increase the chances of electricity spikes, make systems more difficult to operate, or expensive to service or replace. Galaxy 2000 can be inclined to 60 degrees with minimal or no cell compression. Such an incline is made possible with Turn.aido 2000’s technologically advanced design, which combines a unique hinging mechanism, and circular cells that cannot topple, that work together to prevent air cells from falling like dominoes and squashing when the mattress is profiled beyond 40 degrees. For the patient, this slipping down the bed can lead to compression of the diaphragm, and increased lower back strain and for the carer, it can increase the need for the patient to be lifted back up the bed, which contravenes the Minimum Lifting Policy. Designed to harmonize with a new generation of profiling beds recommended by N.C.S.C. (Standard 24.3). A built in hip and knee area hinges to ensure that Galaxy 2000’s “point of articulation” are closer to the level of the spine and legs, than with full depth air mattresses- giving more effective pressure relief when sitting up in bed. 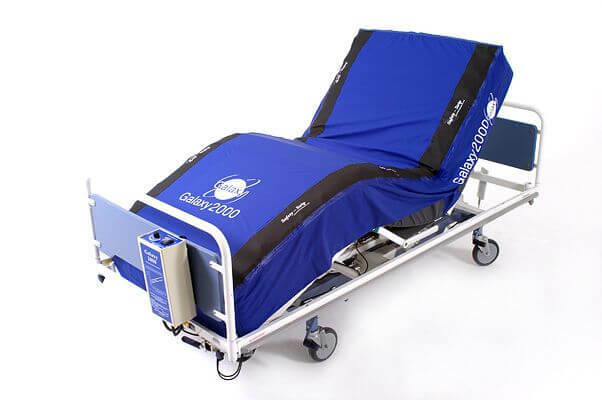 A foam under-layer to provide fail-safe security against mains electricity blackouts and incorrect pressure settings being set, by preventing the patient from bottoming out on the hard bed-frame base. This under layer also provides stability when manoeuvring or getting out of bed. Adjustable to patient’s weight for optimum pressure relief. Waterproof, va pour-permeable two-way stretch covers that are loose fitting to avoid unnecessary tension or hammocking, which could force the cover out of shape. Sealed top surface seams and full depth side flaps minimise the risk of liquid ingress. Power unit is both energy efficient and quiet in operation with lightweight and compact construction, which can conveniently be interchanged with another First Technicare mattresses when necessary. Two adjustable girth straps fasten the mattress securely to the bed frame. Wide versions ideally suited for bariatric patients. (mattress available in any width). 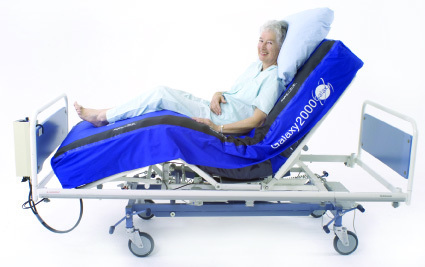 Two ways stretch covers are waterproof/ vapour-permeable for optimum patient comfort and care. Offers a 60-degree incline with minimal or no cell compression, allowing patients to sit up comfortably whilst reading, eating, watching television, with minimal shear. Can be set to stay inflated for approximately 24 hours, if a mains power failure should occur. Patients do not slip down the bed, and therefore it can save nursing time from not having to repeatedly reposition patients back up the bed.